World Vision makes it very easy to communicate with your sponsored child. If your child cannot write yet or a language barrier exists, a World Vision worker will write you in the name of the sponsored child. The child I’m sponsoring is fife years old and speaks French. Though I learned French in school, my French language skills are very modest. But I would like to write in French to this girl. 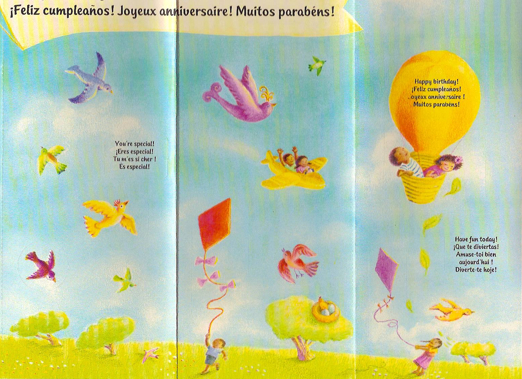 Recently, I received a letter from World Vision that included a neat birthday card for Fatoumata with an age-appropriate drawing puzzle on the back of the card. I took this opportunity and wrote a brief birthday wish in French on the card and mailed it to World Vision, which will deliver the card to Fatoumata. She will get the card way ahead of her birthday, which is in November. I hope Fatoumata will enjoy the card as well as her birthday celebration with other kids of her family and community members, and I’ll hear from her through her World Vision worker. This entry was posted on Sunday, July 22nd, 2007 at 10:59 am	and is filed under General, Sponsorship, Wellness, World Vision. You can follow any responses to this entry through the RSS 2.0 feed. Both comments and pings are currently closed.